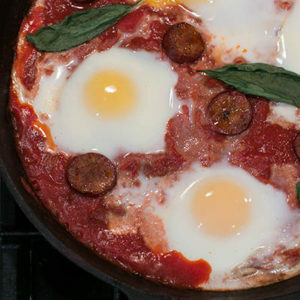 Make the world’s easiest Italian baked eggs with a jar of your favorite marinara sauce. While the oven is preheating at 350°, pour a couple of cups of marinara into a small, shallow baking dish. Use a large spoon to make 4 indentations in the sauce. Crack an egg into each of the indentations. Sprinkle on some freshly grated cheese and bake the eggs for about 10 minutes, until the sauce is bubbly and the eggs look set. Brunch is served.